Hurley, the Official Plantation Dog, now has his own Facebook! Hurley is our nine year old Golden Retriever who is “On Staff” as our official greeter and all around best friend. He spends most of his time between homes in Chesapeake with our son, Tyler, his very best friend and our bed and breakfast in King George, Virginia called Belle Grove Plantation. Belle Grove Plantation is the birthplace of James Madison that sits on a 694 acre plantation overlooking the Rappahannock River. The Southern Mansion was built in 1791 and offers suites and a ton of history. 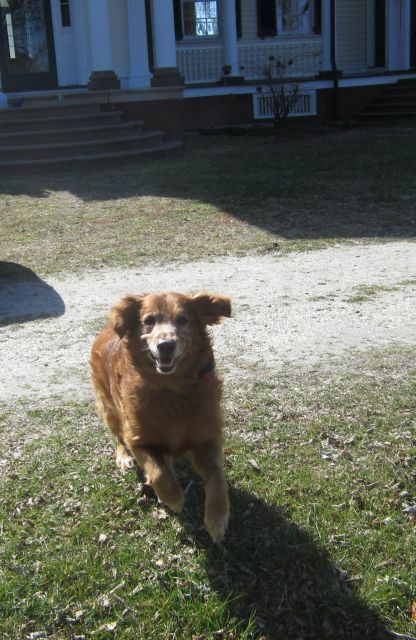 Hurley enjoys his visits to Belle Grove Plantation and comes on special occasions and on special requests.